There is compelling evidence that Donald J. Trump may have personally committed up to eight criminal offenses while campaigning for president and during the first year of his presidency. The potential offenses include violations of laws regulating campaign contributions and their disclosure, making false records and statements, and a conspiracy to defraud (or to violate the laws of) the United States. We take no pleasure in explaining why anyone, much less a sitting president, could face criminal liability for his conduct, but we hope to make two modest contributions to the public discourse on this subject: First, by collecting and setting forth the remarkable volume of facts that have been admitted by two of President Trump’s likely co-conspirators or established in press reports, we hope to recapture the narrative that is so easily lost in an era of ever-shortening news cycles. Second, by articulating how the criminal law could be applied to the facts as we know them, we hope to provide structure to the ongoing conversation about the gravity of President Trump’s conduct. Five of Trump’s potential violations involved his apparent knowing and willful direction, receipt, and concealment of unlawful contributions to his presidential campaign in violation of the Federal Election Campaign Act (FECA), 52 U.S.C. § 30101 et seq. While it is true that technical offenses of the FECA are penalized with civil fines, more serious offenses are subject to criminal penalties. 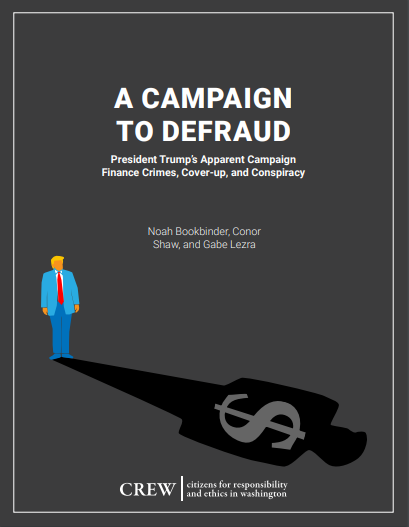 Unlawful campaign contributions or expenditures in excess of $25,000, made knowingly and willfully, are felonies punishable by up to five years in prison. Read the full report, A Campaign to Defraud, here.